Hey all. This has not been the most exciting MLK weekend. The reason for the quietness on the blog is that I have my qualifying exams (eek!) in 10 days. What are qualifying exams? Well, on January 30th, I will sit in a tiny room for 8 hours and answer 6 questions. Two weeks later, I meet with my dissertation committee and talk about my answers for 2 hours. Yeah, it is as awesome as it sounds. I have been doing a little bit of knitting. I was rewarding myself for reading an article with knitting a round of my Heelless Bed Socks. 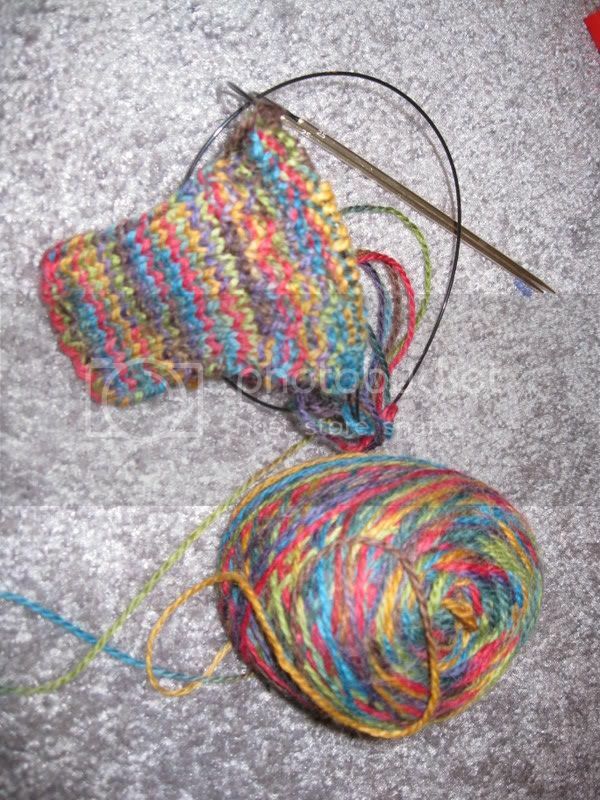 This picture is a bit old, but the progress doesn't make the sock more interesting. Just imagine it longer. These are classic tube socks, so there is no exciting heel or gusset or anything. The yarn is KnitPicks Imagination: Seven Dwarves. I am really enjoying the colors. I heard that this yarn felts a bit, so I was hoping that the heeless-ness and the bed-focusness of the socks will slow the feltyness of the socks. Well, you know what I mean.